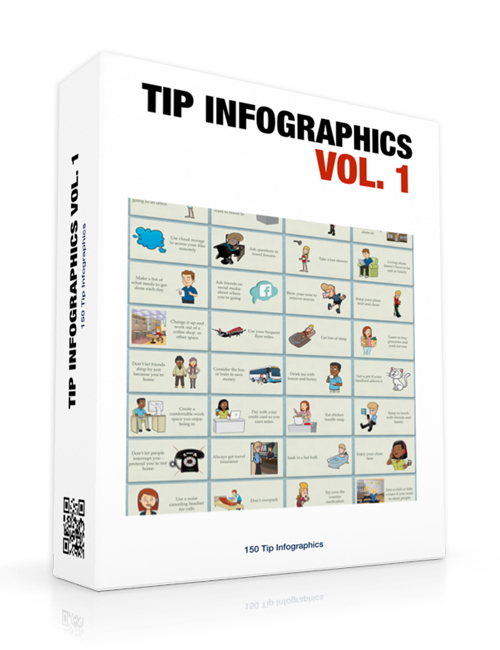 Tip Infographics is the first volume in the two volume set of amazingly attractive infographics developed for marketers and business owners in need of highly creative content. Here you receive 150 infographics in 3 different styles which you can use for your own social media pages, blog, website and more. One thing that isn’t emphasized enough in the online marketing space is just how powerful infographics are, especially when it comes to building a brand and followers. People love infographics because of their ability and simplicity. Infographics combine words and images to get a point across in a fun and creative way. And it so happens that this type of content gets shared and liked more than any other. Slideshows being a close second. In this package, you will receive a whole host of high quality infographics in a number of popular niches. Some of which include fishing, dating, healthcare, fitness, business, travel, diet and much more. There’s a lot of amazing content here ready for you to use as you wish. Get it now.